Kinshasa, the capital of the Democratic Republic of the Congo, isn't a great destination for orderly-traffic fetishists. Generally, it's chaos. But, if you happen to be a much more exciting giant robot fetishist, it's a great place, all thanks to inventor Isaie Therese and her 8-foot tall traffic control robots. Kinshasa has had severe traffic-congestion and management issues for years, and a large part of the problem had to do with people ignoring the usual traffic lights or even human traffic police officers. But nobody — nobody — ignores an 8-foot robot. The robots are solar-powered, which allows them to run all day (and night, via solar-charged batteries), directing traffic with the tireless determination only a robot can provide. Therese designed the robots to be humanoid and reasonably friendly-looking, though they still have a fairly authoritative look. The robots have camera-eyes that can capture images of anyone breaking the law, and have several LED display screens to convey walk/don't walk and other messages to pedestrians. The robot's arms house the red/yellow/green traffic light signals, and the robot and its arms are articulated, with the arms capable of moving up and down and the entire body able to pivot. The vastly improved compliance may simply be the result of the novelty of having a big silver robot tell you what to do, and that may wear off after a while. Alternately, the improved results could be the result of the thinly-veiled threat that if you don't stop, that robot will chase you all over Africa until it finally corners you and mulches you with a pair of spinning robo-claws. And then it would say something witty in a monotone voice as it walked off, into the sunset. Isaie Therese would make a great role model for getting more young girls interested in technology and robotics; it's still a very male-dominated field, and an African woman who's made such a novel and highly visible robotic achievement like this seems like a fantastic choice. Plus, her two robots would make great role models for young robots interested in traffic control. "We are a poor country and our government is looking for money. And I will tell you that with the roads the government has built, it needs to recover its money." 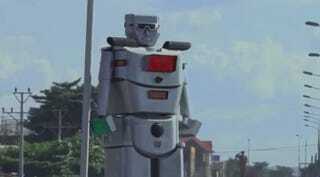 If the Congo needs more money, I think LA would benefit from a boatload of these robots. If I have to stop for some machine, it may as well look awesome.